BroadCam is a completely free, easy to use video streamer designed to broadcast live video over a network or the internet. It will also stream most pre-recorded video files in formats such as a DivX avi files, Windows asf and wmv files, or DV video files. BroadCam handles all the technical compression for you and your viewers can play the stream in a standard web browser from any computer. Viewers do not need to install any special software. ...... BroadCam can also be used to monitor cameras in different locations, making it an useful and inexpensive security tool. BroadCam handles the audio and video stream compression, player format negotiation, bandwidth adjustment and serving over the Internet. Viewers do not need to install any special software to view a BroadCam webcast. 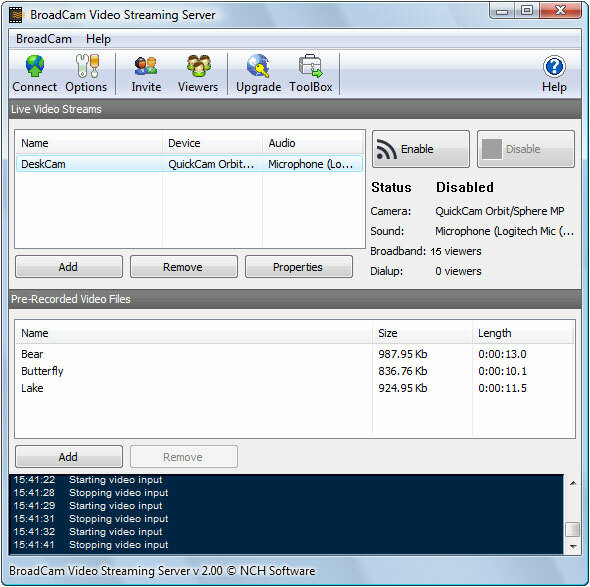 BroadCam streams will play directly from the default web browser on any modern Windows, Mac or Linux computer. BroadCam will also play using a player such as Windows Media Player. * Stream any number of pre-recorded video files. * Stream any video file format. If Windows Media Player can play the file then BroadCam can stream it. * Let viewers choose between Broadband and Dial-up streams. * Stream from your webcam as video or jpg images. Qweas is providing links to BroadCam Video Streaming Software 2.01 as a courtesy, and makes no representations regarding BroadCam Video Streaming Software or any other applications or any information related thereto. Any questions, complaints or claims regarding this application BroadCam Video Streaming Software 2.01 must be directed to the appropriate software vendor. You may click the publisher link of BroadCam Video Streaming Software on the top of this page to get more details about the vendor.